We report our procedures of incision and trocar placement in single port laparoscopic cholecystectomy (SPS Lap-C) for better cosmetic result. [Operative procedure] The 12-15mm incision from the lower ridge of the navel to the bottom was placed for the operation. After dissecting the subcutaneous tissues and pneumo-peritoneum by Verres needle, A trocar of 150mm length was inserted at the bottom for scope. Then, 60mm small head trocars were inserted for handles at the lower lateral in triangle position. For retracting the gall bladder, we insert a grasper directly from the lower edge in the incision or using loop wire in case of the necessity. [Results] 15 cases operated in this fashion in our 20 SPS Lap-C. Other five cases had the incision of totally opened navel from the lower ridge to the upper ridge. Supreme cosmetic results were shown in the 15 cases. Though the five cases got hard navel, they also resulted in invisible scar. All cases were achieved without any complication. [Discussion] Most desirable point of SPS Lap-C is the cosmetic result. Our fashion of the incision and trocar placement contribute to better cosmetic result. Those also preserved air tightness. This procedure may have a potential to eliminate NOTES in the scarless operation with easier handling. 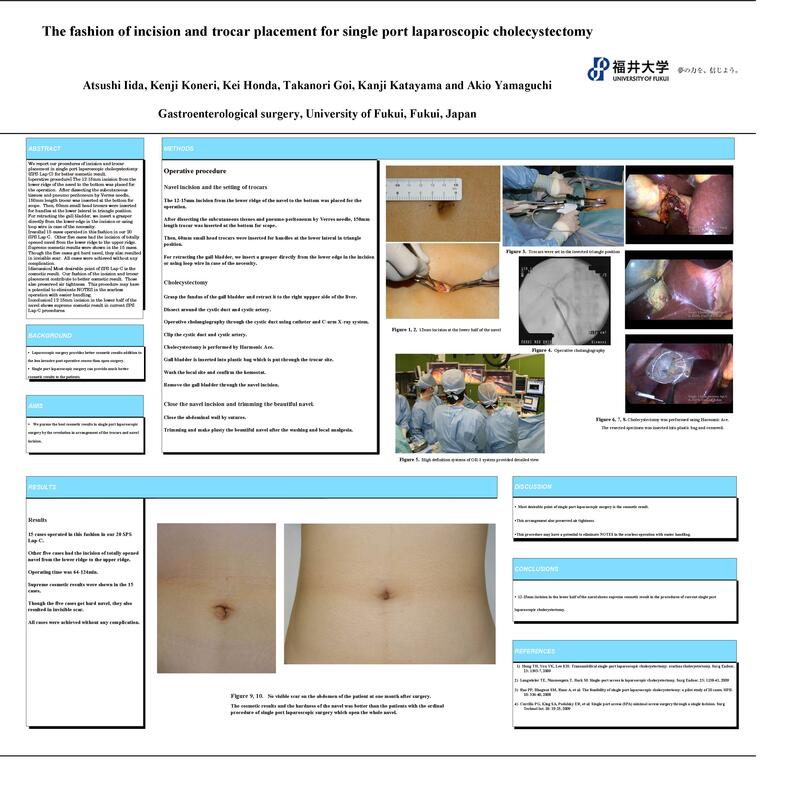 [Conclusion] 12-15mm incision in the lower half of the navel shows supreme cosmetic result in current SPS Lap-C procedures.